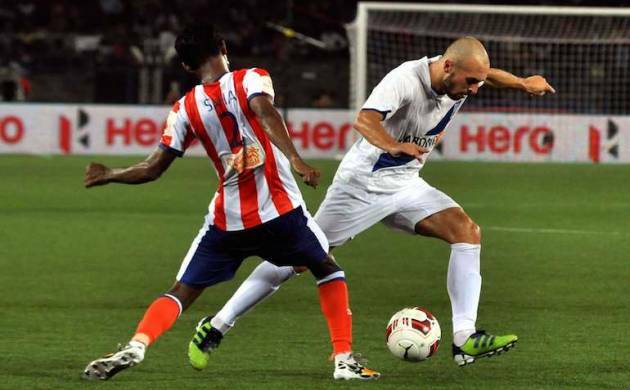 Mumbai City FC moved to the top of the table with a point against Atletico de Kolkata after a closely fought 1-1 draw in Indian Super League encounter played in Mumbai. A 10-man Mumbai City FC moved to the top of the table with a point against Atletico de Kolkata after a closely fought 1-1 draw in Indian Super League encounter played in Mumbai. Mumbai City FC went into the lead with Matias Defederico inding the target in the 27th minute but the home side were jolted when midfielder Pronay Halder was sent after being shown two yellow cards.The numerical advantage worked in Kolkata's favour and they forced the equaliser in the 82nd minute through Javier Lara to stay unbeaten in the league. Atletico de Kolkata now have five points from three matches, while Mumbai City, also unbeaten, are at the top with seven points. Mumbai City FC were forced to leave out Uruguayan legend Diego Forlan after he failed to recover from a knock in the previous clash against NorthEast United FC.Forlan's absence paved the way for Boithang Haokip to start for the first time and the talented youngster was the one who had the best looks at the rival goal. Haokip's first chance was as early as the ninth minute when Defederico picked him up with a wonderful through ball but Atletico de Kolkata goalkeeper Debjit Majumder left his charge to avert the danger even though there seemed to be a possible contact. Haokip again tried his might on goal after being fed by Defederico but this time even though he beat the goalkeeper, the ball struck the crossbar and bounced back into play. The rebound could have been pushed into the goal but nobody got a real touch as the visitors escaped. Mumbai City got their deserving lead, thanks to some brilliant work from Defederico in the 27th minute. The Argentinean showed remarkable skill to control the ball with his first touch and then did even better to leave two defenders behind and slot the ball past a diving Atletico de Kolkata goalkeeper. Atletico de Kolkata were struggling to find their feet in the first session but they were all over the Mumbai territory after the change of ends.Borja Fernandez and Lara were doing all the orchestrating and their best chance to equalize came in the 65th minute. Lara's cross from the right fell unexpectedly for Sameehg Doutie inside a crowded Mumbai goalmouth but Doutie only managed to tap the ball wide from handshaking distance. The match swung in the visitorss favour in the 72nd minute when Mumbai midfielder Pronay Halder was sent off for a second bookable offence. Atletico de Kolkata capitalised on the numerical advantage and got their equaliser through Lara. The Spanish midfielder was class personified as he got away fromJackichand Singh on top of the box and let got a fierce shot that sailed into the top corner of the nets. With eight minutes still left to be played, Atletico de Kolkata pressed hard for the winner but the Mumbai defence did well to troop out with a point.